US National Security Advisor John Bolton was in Ankara to discuss the planned US withdrawal from Syria. Turkish President Recep Tayyip Erdogan on Tuesday condemned comments by a key US envoy over the future of a US-allied Syrian Kurdish militia as a "grave mistake", as tensions flared over Washington's planned withdrawal from war-torn Syria. Erdogan's comments came shortly after US National Security Adviser John Bolton held talks in the Turkish capital with Erdogan's adviser Ibrahim Kalin, in a key meeting focusing on the surprise US decision to withdraw its troops from Syria. But it was comments made by Bolton on Sunday in Israel that had already raised hackles in Ankara, when he suggested the retreat was also conditional on the safety of US-backed Kurdish fighters, considered terrorists by Turkey. "John Bolton has made a grave mistake on this issue," Erdogan told his party's lawmakers in parliament. US President Donald Trump caused a political storm last month when he announced the troop pullout, claiming to have succeeded in the battle against the Islamic State (IS) group. 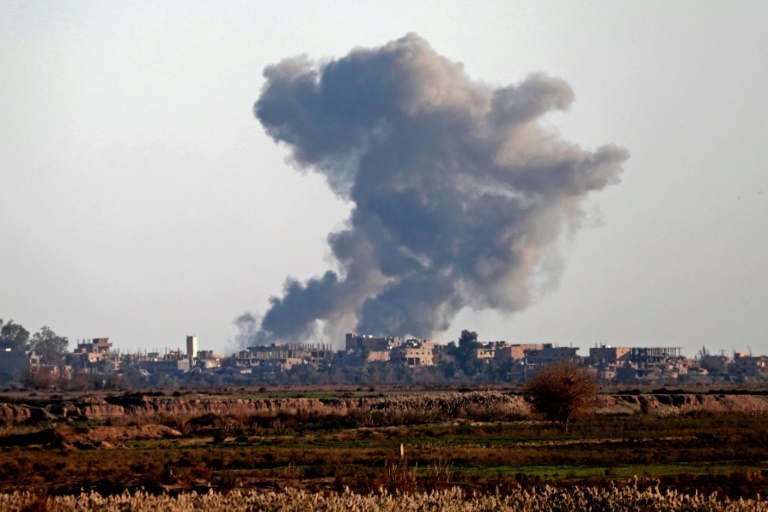 Fighting continues however, with Syrian Observatory for Human Rights saying IS suicide attackers had hit the US-backed Syrian Democratic Forces in eastern Syria late on Sunday, killing 23 of its fighters. The pullout, which Washington has since stressed will be gradual, was hailed by Erdogan as the "right call" in a column published Tuesday in the New York Times. But it has also raised concerns that Kurdish fighters would be exposed to the threat of a cross-border operation by their archfoe Turkey. US-led coalition forces have provided air power and other support to the Syrian Democratic Forces (SDF) in its operation to flush out IS from the last rump of its now-defunct "caliphate". As part of this, American forces have worked closely with the Syrian Kurdish People's Protection Units (YPG) militia, seen by Ankara as a "terrorist offshoot" of the outlawed Kurdistan Workers' Party (PKK), which has waged an insurgency against the Turkish state since 1984. That US military support for the YPG has shaken relations between Washington and Ankara. US Secretary of State Mike Pompeo drew the wrath of the Turkish leadership last week when he said Washington would ensure "the Turks don't slaughter the Kurds" in Syria as American troops withdraw. "That Turkey targets the Kurds is the most vile, the most dishonourable, the ugliest and the cheapest slander," Erdogan said on Tuesday. But the Turkish leader made it clear that Ankara would not soften its stance against the YPG. "Those who are in the terror corridor in Syria will learn necessary lessons," he said. After meeting Bolton on Tuesday, Kalin also urged Washington to take back all the weapons provided to Syrian Kurdish militia forces. He denied comments by Pompeo that Turkey had promised the US not to attack the Kurdish fighters. "Nobody should expect Turkey to provide assurances to a terror organisation," he told journalists in Ankara. Bolton's spokesman Garrett Marquis described the talks as "productive" and centred on "the president's decision to withdraw at a proper pace from northeast Syria". Nicholas Heras, an analyst at the Center for a New American Security, said Ankara would need so much support from Washington to completely eradicate IS, that it would be "to the point where the US military would essentially still be inside Syria". Trump on Monday conceded that the fight against IS was not over. Last month, Erdogan threatened to launch a cross-border operation against the YPG, east of the Euphrates River, which he said later would be delayed after Trump's pullout order.